I am currently the Data Services Librarian at Middlebury College, in Middlebury, VT. I’ve been here since the fall of 2015. Before that, I was the Data Services Librarian at Reed College, in Portland, OR. 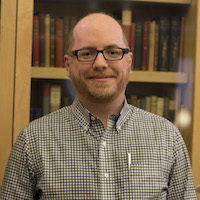 As the Data Services Librarian, I provide general research and technology assistance to students, faculty, and staff at Middlebury, and specialized assistance to those working with data, particularly in the social sciences and humanities. I help with projects involving finding, acquiring, managing, interpreting, analyzing, and visualizing data. I also provide leadership in the development of digital scholarship support at the College. I have worked on support for text analysis, digitization, and qualitative data analysis. I also serve as the subject specialist in the library for the economics, geography, philosophy, and sociology/anthropology departments, and serve as Middlebury’s Government Documents Coordinator. At Reed College, I served as the subject specialist for the psychology and philosophy departments. In addition to my work with data services and digital scholarship support, I also work on library user experience, service design, and assessment. I am interested in the critical perspectives on both information and data literacy. Are you looking for my library guides, or trying to schedule an appointment with me? You can find this information at my Middlebury Library profile page. Outside of my library work, I love baking, biking, craft beverages, and innovative electronic and sample-based music.